I have intentionally not pursued selling the Spirit Books over the years. I've looked at them as a kind of family unit, a series of work that belongs together. I do love to exhibit them. I sense both energy and peace when a gallery is filled with Spirit Books and people. The problem is they are difficult to ship. I have only had solo shows that are within driving distance. Last fall I had a great experience exhibiting them at Wisdom House in Litchfield, CT and this fall at Bright Hill Literary Center in Treadwell, NY. Both were long drives and involved two trips—one to deliver and one to pick up. After coming home from Treadwell a few weeks ago, I decided that I needed to focus on how to put together an exhibition of the Spirit Books that could travel. I have chosen 18 books that I feel are among the strongest and that work together well. I am in the process of creating packing for them. I will then get shipping boxes and be able to figure out weight and size and shipping costs and put together a proposal to send to galleries, libraries, museums, and nature centers. One of the ironies of it all is that I came to books because I loved their portability. 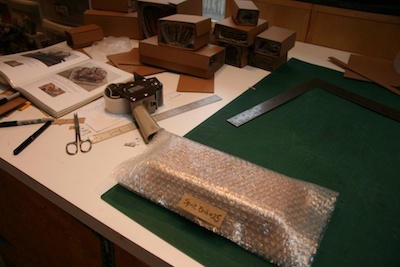 Instead of framed calligraphic pieces, I had, for a short time, small volumes that were easy to ship and store. 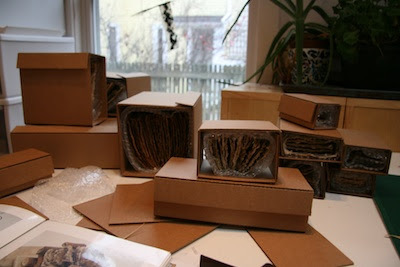 Then one thing led to another and along came the sculptural Spirit Books that don't fold up and have delicate parts. Since I have been moving the books by hand, I made a box to hold each complete book—book, cradle, and base. For shipping, I will be packing each part separately—a box of books, a box of cradles, and one or two boxes of bases—with lots of labeling and instructions. 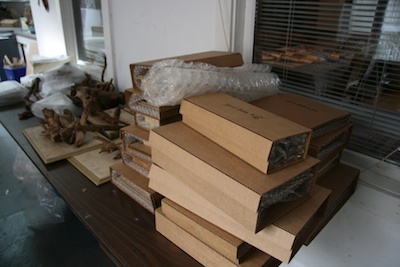 Yesterday the books were spread out all over the living room and the studio. I had this vision that I have the packaging completed by Thanksgiving. Everything was moving along smoothly until I decided I needed a different kind of bubblewrap for the cradles. I couldn't find it locally so I will have to wait for a shipment from Quill. In the meantime, my husband set up a table and everything is there waiting final packing. I hope to have a proposal ready for the new year. Tomorrow will be photo day. The packing will continue when the new materials come. I've always been intrigued by your creations, do you teach the spirit book? Perhaps on line?